Lemons contain a high amount of Vitamin C, which is a powerful antioxidants and essential for strengthening the immune system. So, consuming it in any form is a natural way to prevent viral infections like cold and flu. Lemon water also aids in treating urinary tract infections. One of the main advantages of lemon juice is it helps in improving the liver function and flushing out the toxins from the body. Lemon increase the production of bile in the body that is required for breaking down the fats and lipids. Drinking lemon juice is helpful for people suffering from heart problems, because it contains potassium. It controls high blood pressure, dizziness, and nausea, because it provides a calming sensation to both the mind and body. It is also very helpful in reducing mental stress and depression. Lemon juice aids in relieving respiratory and breathing problems. Lemon juice also help in reducing symptoms of asthma. People with asthma often have low levels of Vitamin C. Lemons are rich in this vitamin and antioxidants that can help reduce asthma symptoms. Squeeze the juice of half a lemon in a glass of water and add some sugar or honey according to your taste. This drink on regular basis to treat the symptoms of asthma. Lemon, as a rich source of vitamin C, helps in dealing with more long-term respiratory disorders. Lemon juice helps to cure problems related to indigestion. During lunch and dinner sprinkle some drops of lemon juice of your salad, it will aid in digestion. Whenever you have a heavy lunch or dinner don't forget to use lemon as salad. Lemon juice also help a lot in curing problems like diarrhoea or constipation. To deal with such problems, intake one glass lemon water at the start of the new day. You can maximize the benefits by adding one teaspoon of honey to this solution. Lemon is well-known for its richness in multipurpose flavonoid compounds which defend your body against different types of cancer. Lemon is found to be anti-carcinogenic which lower the rates of colon, prostate, and breast cancer.Lemon include limonene that slows down the growth of cancer tumors and flavonol glycosides which can stop cell division in cancer cells.Thus, regular consumption of lemon juice ensures the prevention of cancerous cells. Lemon juice is also frequently used in dental care. If fresh lemon juice is applied on the area of a toothache, it can assist in getting rid of the pain. Massaging lemon juice on the gums can stop gum bleeding, while eliminating the bad odors that can come from various gum diseases and conditions. A mixture of salt and lemon juice also help a lot to get white sparkling teeth.For teeth whitening you can also use a mixture of baking soda and lemon juice. Mix the two ingredients into a bubbly solution and apply on your teeth. Leave on for no more than one minute (the acid is strong enough to break down tooth enamel) and gently scrub off with a toothbrush. The citric acid in lemon helps to dissolve gall stones, kidney stones as well as calcium deposits. Try to drink lots of water by adding some lemon juice. Acidic content in lemon prevents the growth of bacteria on the tongue and gums. You can even create a mixture of salt and lemon and rinse before bedtime to cure bad breath.Lemon juice freshens your breath in addition to providing relief from gingivitis and tooth pain. Lemon Contains a good amount of Vitamin C which creates a natural glow in your skin. Drinking lemon juice mixed with water and honey brings a healthy glow to your skin. Lemon is considered a natural bleaching agent.It not only lighten your dark complexion but also give you a blemish free skin. To lighten your skin tone follow the given instructions. Take half lemon, sprinkle some salt over it. Now rub it all over you dark skin. Let it absorb into your skin at last for 15 minutes. Note: While applying lemon juice don't go out in sun, it may further darken your skin by increasing the production of melanin pigment. Whenever you go out in sun, don't forget to apply a good sunscreen. Take a half a lemon and add a few drops of honey. Apply it directly to the area where you have blackheads. Wait 5-10 minutes before rinsing off with cold water. 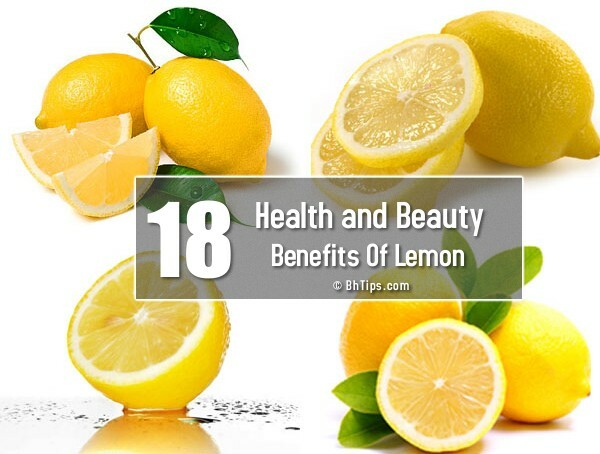 Lemon also help to get rid of oily skin. You can get rid of oily skin by following given instructions. Simply dip a cotton ball in some lemon juice. Apply this on your face before bed. Wash your face the next morning to prevent oily skin. Acne scars and marks are really embarrassing and annoying but you can reduce their appearance by lemon juice. Citric acid present in lemon juice gradually fades spots and evens your skin tone. Be aware and don't apply lemon juice on open wounds or cuts on the face on any area of skin because it may cause severe pain and may worsen the condition. If you have freckles, then lemon will help to lighten them. Use freshly squeezed lemon juice on freckles before going to bed at night. Follow the method for two weeks to see the freckles appear lightened.If you feel the raw juice is too strong for your skin, add a little water to dilute it. This way will decrease the intensity. Lemon juice can also help to reduce the appearance of wrinkles. Follow the given instructions to make the anti-wrinkle mask to reduce the appearance of wrinkles. Take a tablespoon of honey and add some drops of lemon juice to it. Add a few drops of almond oil (sweet) to this and mix the ingredients into a paste. Then use this on the face and keep it on for 15-20 minutes and then wash off. Rich amount of Vitamin C in lemons makes nails healthy and strong. You can strengthen your nails by following given instructions. Massaging the nails with a bit of lemon juice is the best remedy to make them bright and full of life. Lemon water soak also provides the same benefits.You can enhance the effect by adding some olive oil. The solution will not only condition weak and brittle nails, but it will also whiten yellowing nails. Lemon juice help a lot in reducing weight as the high amount of pectin fiber in this juice benefits your body’s fight against hunger cravings. Drinking a solution of freshly-squeezed lemon juice and water is an effectual remedy for losing extra pounds naturally. To burn excessive fat drink a glass of lukewarm water by mixing one lemon juice and half teaspoon of honey. Have this drink on an empty stomach.